Things are busy in the greenhouse this time of the year! We are putting the finishing touches on the hangng baskets and planting our benchcrops at a rapid pace! Sow fresh seeds individually into each container according to package directions. If you are unsure about seeding depth, a rule of thumb is to plant a seed four times as deep as its width. Think of it as planting a seed deeply enough that three more seeds could be placed directly above it. Mark each pack with a tag, either purchased or made by cutting strips from plastic jugs. Use permanent marker. Some seeds require light to germinate. Cover them with a thin layer of fine vermiculite, porous enough to permit light to penetrate yet keep the medium moist enough to encourage seed germination. Place cell packs containing seeds that need darkness for germination in dark plastic bags or cover them with several layers of newspaper until seeds sprout. When using older seeds with lower germination rates, plant two or more seeds per cell. Once the seedlings have developed true leaves, cut all but the healthiest one off at ground level with scissors. If you try to separate and transplant seedlings, or try to just pull the unwanted seedlings out, you’re likely to damage the roots of the one you want to keep. A windowsill is not a good location for starting seeds. If you’re starting only a few plants and have roomy window sills, a south-facing window may be all the growing space you need. But window sills can be the coldest place in the house, especially at night, and then the hottest during the day. Although sunlight in Minnesota gains strength through April and May, the months when seeds are usually started and seedlings kept indoors, sunlight through a window is relatively weak, compared to artificial light sources kept close to the plants. There are also many cloudy days of very low light levels during a Minnesota spring. Most seeds need consistently warm soil to germinate and produce strong roots. Cooler soil temperatures can also lead to seedling death due to disease. Excess heat during the day can completely dry out the potting mix, again leading to seedling death. Even if windowsill temperatures are controlled, light coming from the side, rather than from above, will encourage bent, rather than straight stems. Windowsill-grown seedlings tend to be excessively tall, with thin, bent stems. Finally, starting seeds on a windowsill can lead to water damage to the woodwork. Instead, choose a place safe from heavy traffic, pets, cold drafts, and excess heat; where spills of potting mixture, water, or fertilizer will not be a problem. Allow space to accommodate later sowings of seed, as well as the space the seedlings will take up as they grow and are transplanted to larger containers. Air temperatures above 60°F are adequately warm if bottom heat is provided, so even a basement can be a good place to start seed. Stop in and check out our selection of Houseplants and succulents! Also, don’t forget to bring in an empty jug to fill with free fertilizer water for all of your house plants this year! Fairview Gardens is your source for all types of color options for your containers, gardens and yards! Enjoy a brief slidshow of all the beautiful plants we carry. What corner of your yard do you need to enhance? 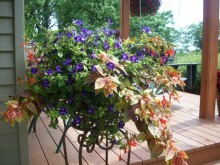 The best for filling hanging baskets, window boxes, urns, patio pots, and focal points. Try and pick areas that a touch of color would accent your homes best features. Doorways, decks, paths, posts are good starting points. Try to plant in containers that can be seen from a distance. Good scale and blocks of color are always striking from a distance. There is always a large selction of annuals to choose from. Make sure you know what your sight and light condtions are so you can make the best possible choice for your home. Fairview Gardens has all you need for a bounitful garden! We can teach you what to grow and how. Fairview Gardens carries organic options to amend your garden soils and container vegetable gardens. We also carry alot of patio gardens for those of you who can’t garden in your yards! Fresh Herbs are also a passion, from rosemary to basil we will have it coverd! Who says you have to live in a temperate climate to enjoy that look at home? It is possible to create a yard or garden that will make you feel like you have moved to another part of the world. Even if you live in the colder regions of the country, tropical looking plantings are possible including banana trees. In the tropics, there is lots of leafy lushness and big blossoms that are decadent in hot colors. To pull that kind of look off in the north you want to look for plants with huge bold leaves. Tropicals can tolerate those extremely hot decks with ease! Big plants help make any space feel like a private resort! The greatest accent to your yard! Perennials are lower maintenance and only require one planting! Come and check out our new perennial program. We are growing a huge selection on the hardiest MN grown plants. These plants are always a staple to any planting situation. It is essential to plant trees for structure and shade in our yards. Shrubs act as room barriers and encase our homes and living areas. Together they can be the basis to our overall landscape design. Remember that today is the best day to plant a tree!